Do you hear claws pitter-pattering across the floor of your attic at night? Have you noticed unexplained damage on the exterior and interior surfaces of your home? 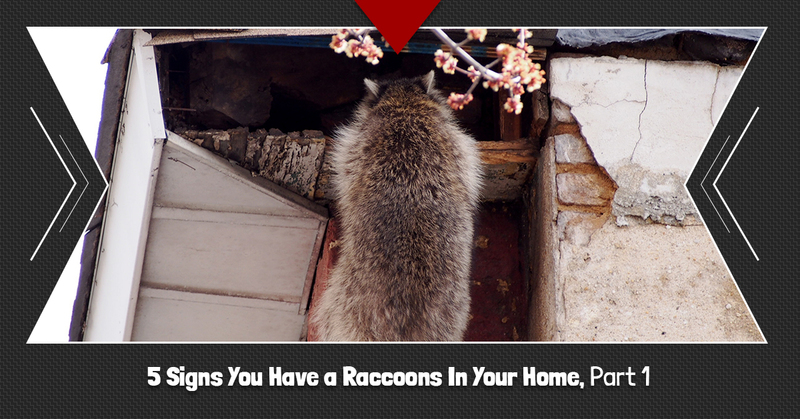 These are just some of the signs telling you that you may have raccoons living in your home. But there’s no need to fear! The wildlife control team at Critter Wranglers can safely remove these cute but destructive creatures from your Knoxville home. Here are five signs telling you that you just might have raccoons living in your home. Want to get rid of them? Call Knoxville’s Top Rated Local® raccoon removal experts to request a quote and we’ll get rid of your raccoon problem for good. When you hear strange noises at night coming from your attic, this is a telltale sign that raccoons have invaded your home. From bumps and thumps to clawing and gnawing, there aren’t too many urban pests that are large enough to make such a racket. Plus, raccoons are vocal creatures, especially when adult raccoons have a litter of kits. While baby raccoons make higher pitched, crying sounds, adults make deeper, louder vocalizations. Have you recently noticed torn-up shingles or siding on the exterior of your home? Have you noticed where sections of gutter or soffit have come loose or are missing? If you notice damage to your home that can’t be blamed on severe weather or that you know is recent damage, this could be a sign of a possible entry point for raccoons. Raccoon droppings are dark in color and tubular in shape, and typically run about two to three inches in length, often containing undigested food such as berries. If you notice piles of raccoon poop around your trash cans, in your yard, in your garden, or even in your home, such as in your attic or basement, you likely have a raccoon problem. Once raccoons take up residence in a location, they immediately build nests for themselves. They will build comfy, cozy nests out of an array of materials, including insulation, old clothes, towels, newspaper — basically anything that will provide them with cushioning and warmth. If you notice shredded materials or a mess of items stored in your attic that have been strewn about, you have probably got raccoons. If you actually see their round, fuzzy gray and black bodies scurrying away, or you see a line of glowing eyes hovering around your yard or trash cans at night, raccoons have definitely taken an interest in your property. Keep in mind that while some male raccoons are more solitary, female raccoons, raccoons that have coupled for mating, or female raccoons with kits, travel, hunt, and forage for food in packs. If any of these signs sound familiar, you probably have raccoons living in your home or on your property. That’s when you need to call your raccoon removal experts! At Critter Wranglers, we employ efficient, humane methods for removing unwelcomed critters from your home while also preventing them from returning. If you think you have a raccoon problem in your home or business, call us for a Top Rated Local® wildlife removal in Knoxville.